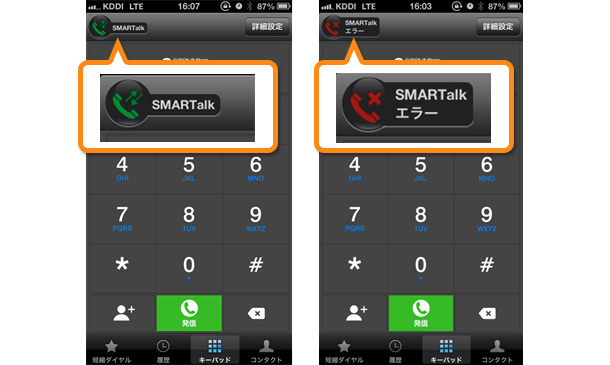 How to install/use the "SMARTalk" app. 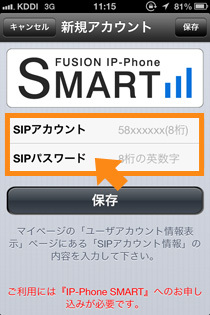 Go to the "Fusion IP-Phone SMART" website (https://ip-phone-smart.jp/) and click on "App Store" to download/install the app. Download "SMARTalk "from the App Store. Go back to the top page (https://ip-phone-smart.jp) and click on "MYPAGE". A login screen will then come up. Enter your email address and password . Then, click on the "login" button below. Go to "User Account Information" and confirm your SIP Account and SIP Account Password. Those credentials will be required when you login from the smartphone App. Open "SMARTalk" and it shows "new account" screen. Enter your SIP Account and SIP Password on the "new account" screen. Click "Save" at the bottom when completed. Check the color of the upper left icon. If it's green, you can make a call. If it is red you are not connected. * If you find red icon on the upper left , there has been a "login error". 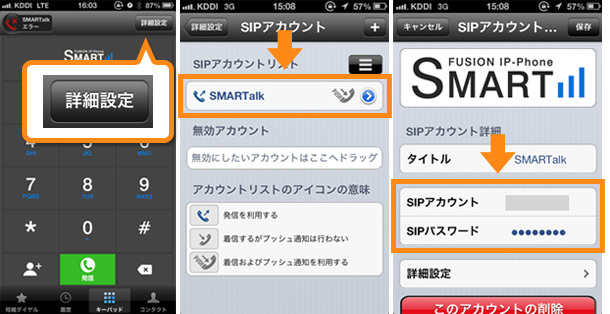 Please go to "Setting" on the upper right screen and select "SMARTalk" . Please re-enter correct account name and password.